The complex of Jordanian salt evaporation ponds at the southern end of the Dead Sea has expanded significantly over the past dozen years. 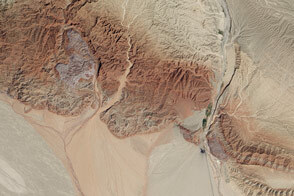 The western margin of the salt ponds marks the Jordan-Israel border. 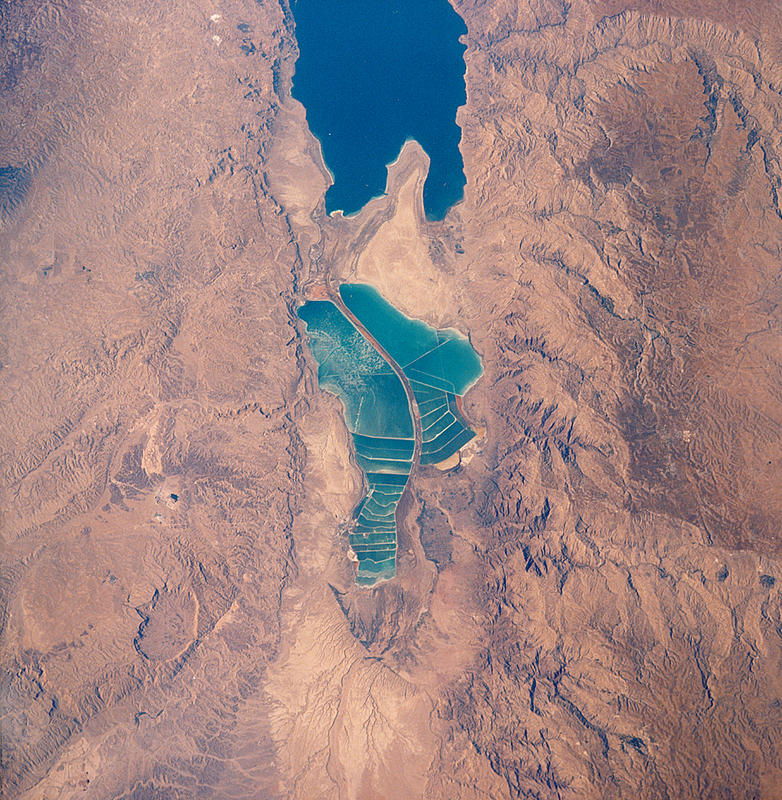 In August 1989, when the crew of Space Shuttle mission STS28 photographed the region, the northern extension did not exist and the large polygonal ponds in the northwestern and northeastern sectors had not been subdivided. 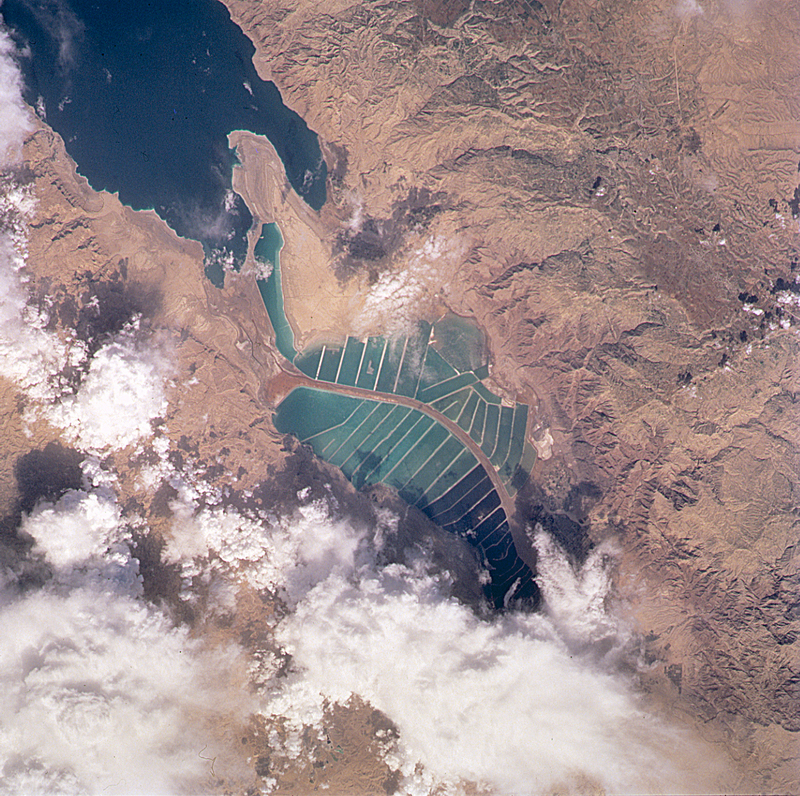 In the view taken by the STS102 crew in March 2001, one can see that there has also been expansion at the southeastern end, and that levees now segment the northeastern wedge into four ponds. 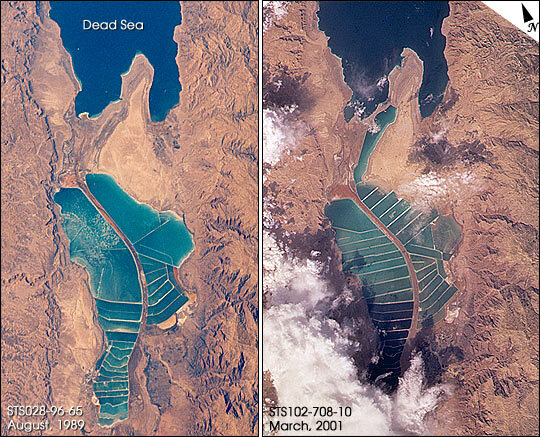 Both sodium chloride and potassium salts are produced from the Dead Sea ponds. Salt-evaporation works are expanding throughout the world in response to increased manufacture of polyvinyl chloride (PVC) and other chemicals, for which salt is a principal feedstock. About 22.4 million metric tons of salt (sodium chloride) were consumed by the chemical industry in 1996. Other uses are in human and animal nutrition, water conditioning, and road de-icing. Images STS028-96-65 and STS102-708-10 were provided by the Earth Sciences and Image Analysis Laboratory, Johnson Space Center. Additional images taken by astronauts and cosmonauts can be viewed at the NASA-JSC Gateway to Astronaut Photography of Earth. 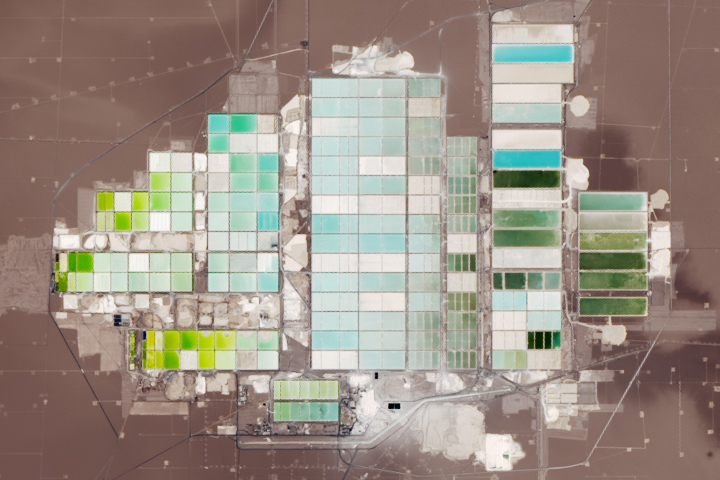 The complex of Jordanian salt evaporation ponds at the southern end of the Dead Sea has expanded significantly over the past dozen years. 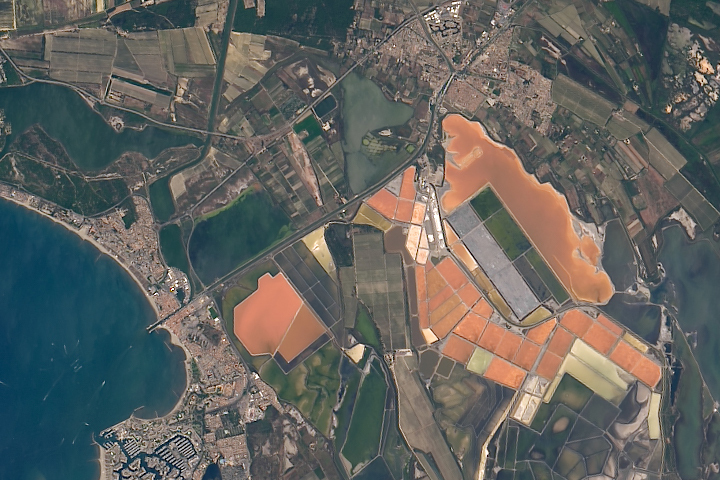 The western margin of the salt ponds marks the Jordan-Israel border. In August 1989, when the crew of Space Shuttle mission STS-28 photographed the region, the northern extension did not exist and the large polygonal ponds in the northwestern and northeastern sectors had not been subdivided. In the view taken by the STS-102 crew in March 2001, one can see that there has also been expansion at the southeastern end, and that levees now segment the northeastern wedge into four ponds.